When that novel came out in 1910, the organized rail system already connected cities throughout Europe. Today's Rail Europe, an incarnation from the early 1960s, boasts a sophisticated rail network that stretches over 160,000 miles in nearly two dozen countries. Generally, the rule of thumb is when distances are too great, it's best to fly — e.g. from Scandinavia to Rome. In remote areas, it's a good bet to rent a car. But, if you want to experience Europe to the utmost, consider taking the train. You'll find that trains are punctual (often to the second), comfortable, convenient, safe, smooth and easy. While first class features larger, reclining seats and a few more amenities, second class is less expensive, yet still offers creature comforts. One country that certainly delivers spectacular scenery is Switzerland. 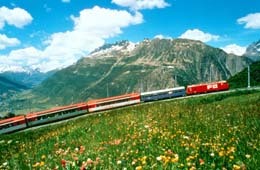 In fact, the Swiss Travel System offers 12 scenic train routes. Here’s an overview of two of them — the Glacier Express and the Golden Pass. 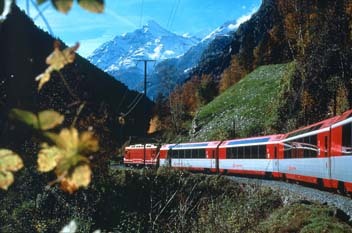 The Glacier Express, which connects the resort cities of Zermatt and St. Moritz, has been touted as the world’s slowest express train. This adventurous journey takes seven and a half hours, goes over 291 bridges and through 91 tunnels, and crosses the magnificent 6,708-foot-high Oberalp Pass. Of course, you may opt to do a portion of the trip. But the time goes quickly as you’re spellbound by the panoramic views of snowcapped peaks, dense forests, clear mountain streams, typical Swiss villages and alpine farmhouses. Here, you are in the heart of the Swiss Alps. You’ll be positioned in contemporary cars with comfy wide seats. Depending on your ticket or pass, you might be in one of the glass-roof observation cars. Along the way, listen to a taped commentary that’s available in English, French and German. Take time to enjoy a leisurely three-course meal in the Edwardian dining car, replete with wood paneling and brass fixtures. It’s fun to see the tilting wine glasses, so your drink doesn’t spill during steep gradients or turns. Or relax in your seat and buy a diversity of snacks, and hot and cold drinks from the stewards’ cart. Marking its 75th anniversary this year, the Glacier Express made its first run between Zermatt and St. Moritz on June 25, 1930. The completion of the 9.5-mile Furka Tunnel in June 1982 made it possible for the Glacier Express to operate year-round. During the summer months, the train runs five times daily, while during wintertime (usually November to April), it runs once a day. You’ll see blankets of flowers during spring and summer. Crisp autumn brings its own colorful tapestry, and the colder months do, indeed, become a white wonderland. If you begin your journey in St. Moritz, you’ll learn that the area is known for its “dry sparking champagne climate,” its chic, relaxing atmosphere and natural environment. At an elevation of 6,000 feet, St. Moritz reportedly has 322 days of sunshine each year. Nearby, trek through the world of glaciers, visit the Swiss National Park, hike the trails around picturesque Lake Sils, or just go shopping. If you’re there between the end of December and the first of March, venture down the natural ice bob run. Consider going to the largest whiskey bar in the word at the Waldhaus Hotel at Lake St. Moritz. On the other side of the Glacier Express, Zermatt lies in the Valais region in southwest Switzerland. Home to mountains and glaciers, Zermatt is a car-free area that only allows electric cars, horse drawn sleighs and carriages. During the warmer months, you can hike, hop on a mountain bike, enjoy summer skiing or take in 1,000 different species of plants in the mountain meadows. Wintertime brings out the best of snow sports with skiing, sledding and snowboarding. The highlight of any trip to Zermatt is your first awe-inspiring view of the famed Matterhorn. Rail Europe’s Golden Pass cuts a swath connecting the Lake Geneva region and Central Switzerland. 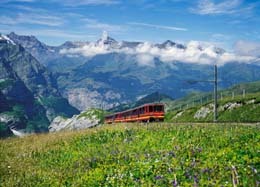 Along the breathtaking route, you’ll see alpine peaks, eight lakes and ascend near the Jungfraujoch or “Top of Europe.” You do have to change trains, but this process is hassle-free. Known for its star-studded annual summer Jazz Festival, Montreux lies on the northeast shore of Lake Geneva. Surrounded by terraced vineyards and mountains, Montreux really is a place of quiet beauty. Walk along the lakeside to see for yourself. You’ll likely see why Montreux has long held fascination for poets, painters, musicians and writers. If you happen to be in Montreux on a Wednesday between June and October, be sure and take advantage of another Golden Pass service. And that’s the fun-filled, palate-pleasing Chocolate Train. In the morning, you’ll board the Belle Époque coach and soon be given coffee and buttery croissant. After an hour and 15 minutes, the train stops in Gruyères where you’ll visit the famous cheese factory and village. Gruyères has produced its famous cheese in this district for centuries. Afterwards, you’ll take the 30-minute trek to Broc for a tour, film presentation and complimentary chocolate tasting at the Cailler-Nestle chocolate factory. Yum. Then the train returns to Montreux at 5:40 p.m. The Golden Pass journey continues east from Montreux to Interlaken, the smallest German-speaking community in the canton of Bern with its own parliament. Hugged by mountains, Interlaken means “between two lakes”— the clear waters of Lake Thun and Lake Brienz. Tour the village, and note the trimmed old houses that date between the 16th and 19th century. Interlaken is considered one of the strongholds for outdoor offerings in Switzerland. In the summertime, for instance, you can go paragliding, river rafting, ice climbing, bungee jumping, horseback or bike riding, glacier trekking or canyon climbing. During the winter, opt for snowshoeing, sledding, canyon jumping or frozen waterfall ice climbing. Nearby, you can take the Jungfrau Railway to Jungfraujoch, Europe’s highest train station. 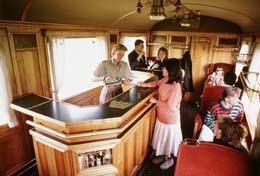 Since 1912, this train has been transporting visitors to the peak at 11,333 feet. It’s an unforgettable ride and awesome panorama. Next up, the Golden Pass train takes you from Interlaken to Lucerne, a classical city of culture, history, museums and architecture. Its backdrop of mountain peaks around Lake Lucerne is picture postcard material. One of Lucerne’s landmarks, the Water Tower dates to the 13th century and was part of the city’s fortifications. Since then, the Water Tower has been home to an archive, a prison and a torture chamber. In Lucerne, there’s a plethora of places to visit, but in particular, try not to miss the Swiss Transport Museum with IMAX Theater. With more than 3,000 items on display, this museum houses one of Europe’s most comprehensive collections from the world of transport and communications. Even though the Golden Pass ends at Lucerne, keep in mind that other scenic train trips await your next adventure — and pleasure. 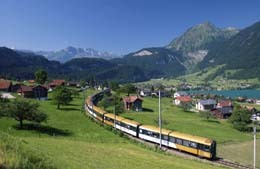 Rail Europe, which is part owned by the Swiss Railroads, is the supplier of all Swiss Passes and scenic trains. Choose among the Swiss Pass, Swiss Flexi Pass, France ‘n Switzerland Pass, Switzerland ‘n Austria Pass or other options such as the Rail Europe Flexi Pass. Bear in mind that the Swiss Travel System Family Card is an ideal way for children under 16 to travel free when accompanied by a parent. When you purchase passes, you receive a number of bonuses such as boat rides, reduced hotel rates and discounts on city tours. Also, be sure and check out rail and hotel packages. Award-winning Kay Harwell Fernandez has written hundreds of articles in 80-plus publications. She has been a journalist for two decades and a full-time freelance writer for several years. She has been editor of a number of trade and consumer magazines. Her focus is travel writing, especially as it pertains to art, culture & history, and cuisine. She can be reached at kfernan331@aol.com.